Love the detail you've gone to matching it up with the dash with the red stitching too. It's the sort of thing I do and did to my Elise when I had it took me months to decide what to do . https://www.gregsraceparts.com/collections/evora-interior/products/grp-steering-wheel-horn-emblem-badge-for-evoras Greg's raceparts in the US do them not sure if quality or removal of old one etc don't know of anyone else doing specific badges for the steering wheel though. Sorry I have an N/A not supercharged so my plugs are different. Supercharged take an NGK plug from memory. 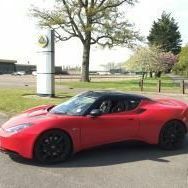 I purchased these for my Evora from a Toyota dealer in the UK https://rover.ebay.com/rover/0/0/0?mpre=https%3A%2F%2Fwww.ebay.co.uk%2Fulk%2Fitm%2F182046865070 Plugs on eBay £69.99 for set of 6. Dread to think what you'll be paying JCT per plug I would order them and get them to fit them ( I'm a tight bugger though). I thought this issue was only on models sold with the optional close ratio gearbox??? I have the same issue with mine it would be good if someone had a simple DIY fix for this but I don't think there is one. Lotus talk have a full post on this subject and the step by step removal of the dashboard to replace the clips which I have considered doing but can't justify doing it if it will happen again soon afterwards . What a bargain. I have a radium on my NA too bloody awesome. 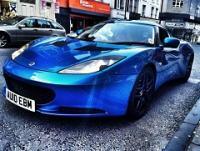 I purchased mine 2nd hand 2 years before I got my Evora lol. Bloody awesome! Thats disappointing to hear the locator bolts have come off I would use tiger seal. Takes time to set but you know it won't ever come back off. Hi Paul, I am looking at the speaker upgrade that you recently did. There seems to be a few versions of the Focal PS 165 kit - are their any other specific reference letters /numbers to identify the exact kit you used? Also, is there much wire snipping / soldering required or are the terminals the same as he outgoing Alpine speakers. I had no new wires for the new door speakers but the tweeters came with wires attached so that should make the tweeters easy to do. Hi Paul - hopefully last question as I have nearly done 1 side! Did you use the same crossover settings as Wozza? Gain -3db and Frequency position 3? Oh yes forgot about that. Yes I did cos wasn't sure what to choose and was in a bit of a rush lol. Could be worth giving them a test in the other positions to see what difference it makes though. Gutted for you. This has happened to me before. Luckily mine was a scratch into the laquer and polished out well with gtechniqp1 and a tri polishing pad. It's amazing what that stuff gets shot of. To be honest mine isn't factory finish lol. I have zip tied the relay next to an original factory fit switch/ relay nearby so it isn't to pretty but works fine and is easily reversible if I ever come to sell the car. If it were to be a permanent fixture I would complete the full integration and make a lot tidier job of hiding the wires and mounting the relay. This sounds great. When I get chance I'll take a picture of the relay I worked with. I also used a piggy back fuse holder for the switched live, it worked a treat. After spending the day at Scarborough and getting loads of positive reactions to my car I had a chav scallywag by himself on the pavement make a point of leaning out into the road and do a full on w*nker sign the other day in Scarborough when I was driving past. I gave him the thumbs up and a big smile. Usually it's when there with a Crowd but he was alone.... I found it very bemusing for him to do it for his own pleasure alone. I actually only carried out the first stage of the wiring so when I switch my headlights on the interior light comes on if in the on position. However I allways have mine swichted to off anyhow as on entry the footwell lights light the way so it doesn't bug me.